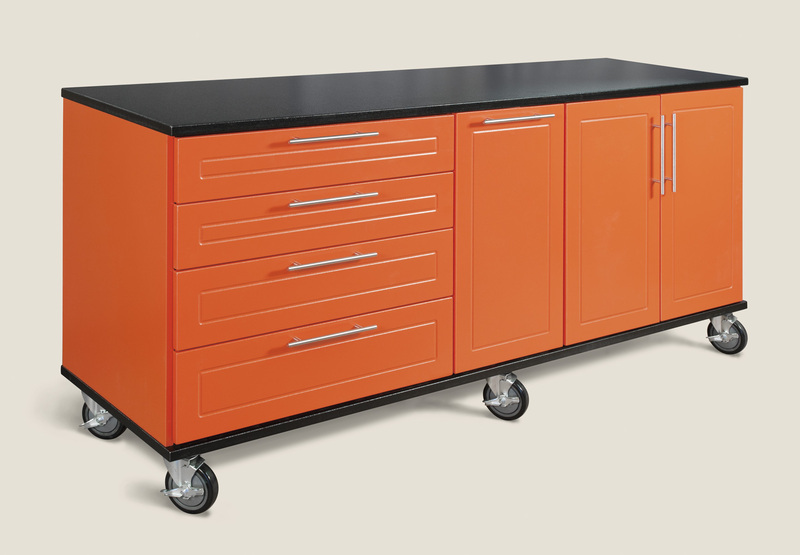 Greenberg Casework Company Inc. child company, RedLine Garagegear, has been giving away garage workbenches since June of 2012. The ‘Win a Garage Workbench Contest’ has been widely successful with prizes awarded to half a dozen grand prize winners and a couple dozen runner ups. Greenberg Casework Company Inc. is hoping to spread some of that social proof around by adding a contest to its latest venture: Garage Talk Blog. We’ve been working tirelessly to get the Garage Talk Blog up and running. There’s a lot of good, relevant information on the blog and we are hoping it will grow into a community of DIYers, gearheads, tinkerers, and others from all walks of life. Despite wading into the social media waters reluctantly and a bit late, RedLine Garagegear has gained quite a bit of momentum and traction in a short amount of time. The company has built a strong following on Facebook as well as Twitter and takes full advantage of the picture centric social network Pinterest. Learning from its previous success, Greenberg Casework Company is hoping to build the same social proof fairly quickly for its new blog: Garage Talk. The manufacturer’s latest online initiative puts out several blog posts a day covering a variety of topics including: home improvement projects; garage organization; gearhead news, reports, and events; among many other things. It is a part of a wider project which will include a new website and e-store set to be rolled out early next year. Garage Talk will be the new host of the ‘Win a Garage Workbench Contest’ in December. The contest will feature the same prizes and rules but will be moved to the Garage Talk Facebook page. An opportunity to get extra entries in the contest will also still be available to contestants who get friends and family to sign up through their generated unique link. Once a winner is selected on November 30 at 9:00 pm for that month’s contest half a dozen workbenches will have been manufactured, assembled, and shipped to grand prize winners in various states throughout the country including: Arizona, New Jersey, and North Carolina. 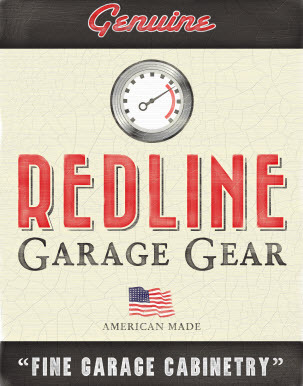 Nearly two dozen runner ups have also received nostalgic RedLine Garagegear signs. Greenberg Casework Company Inc. has been manufacturing custom made casework and cabinetry since 1985. Up until the recent economic downturn, the company was doing quite a bit of subcontractor work on large developer projects. After seeing the lack of quality solutions in the garage storage systems market, the manufacturer began developing garage cabinet lines to sell to residential homeowners. 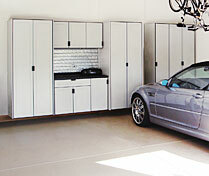 The custom garage storage solutions offered by RedLine Garagegear were the result of those developments. Greenberg Casework is developing another line of garage cabinets that are a little less custom but still quality and durable. That will be the featured line on the new website and e-store coming next year. 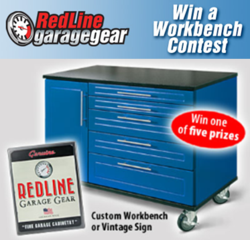 There’s still time to enter the November ‘Win a Garage Workbench Contest’. That contest will end on Friday November 30, 2012 at 9:00 pm and the winners will be announced shortly thereafter. The December contest will begin on the first of the month. To stay posted on who won the November contest, when you can enter the December contest, and all the new blog posts being put out on Garage Talk be sure to Like the blog’s Facebook page. Garage Talk Division of Greenberg Casework Co, Inc.
Garage Talk Division of Greenberg Casework Co. Inc.
Digital Print RedLine Garagegear Vintage SignAn image of a RedLine Garagegear vintage sign was digitally printed on a piece of black powder coated wood. Garage WorkbenchA Garage workbench makes a great tool organizer. Garage CabinetsIf you are wondering how to organize a garage with a compressor, lawn mower, or golf clubs you want to hide, we have the solution for you RedLine Garagegear garage cabinetsRedline Garagegear is available in 11 powder coated colors. 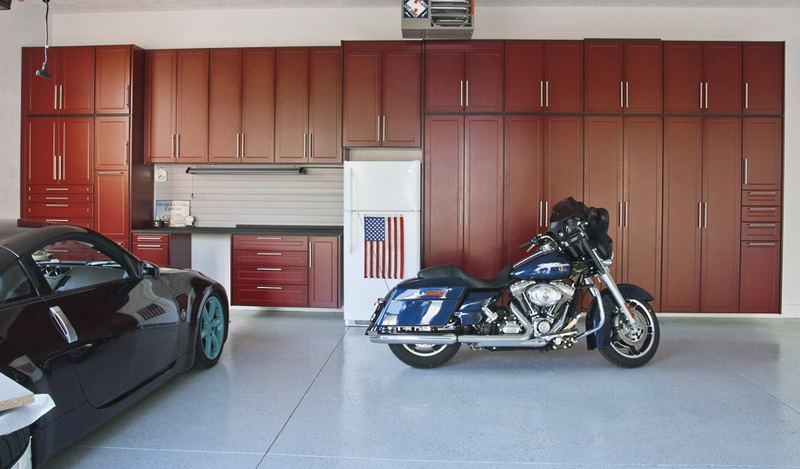 Powder Coated MDF is the perfect product for the garage environment.